Team Blake was shining brightly during this rousing and fun tribute to one of country music’s greatest singers – and it couldn’t have come at a better time! 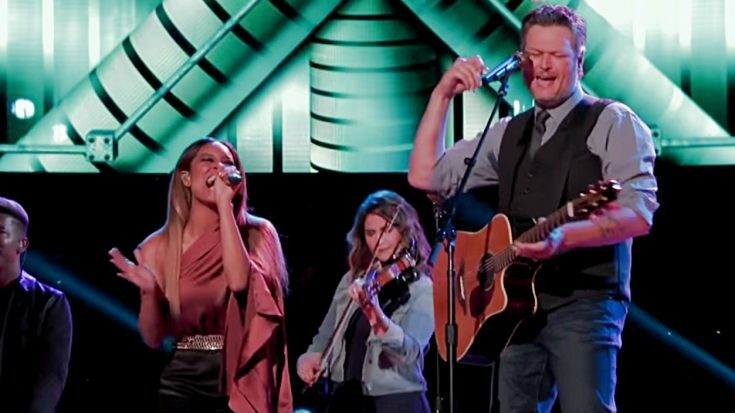 Taking the stage for the two-part Voice finale tonight (May 21), both Blake Shelton and one of his two finalists, Spensha Baker, rose to the occasion and sang some real, twangy country music. @spenshabaker & @blakeshelton you guys slayed it. Go Spensha!! Teaming up for a duet of Tanya Tucker‘s 1993 hit duet, “Tell Me About It,” both crooned away with a full backing band and talented fiddle player to help ignite the performance! Tucker’s hit, which was originally recorded with Delbert McClinton as her duet partner, got the royal treatment during this epic cover – and the proof is in the video! While they clearly had captivated the studio audience, Shelton and Baker both gave some of the best performances of the night with this growling, gritty, and upbeat rendition of Tucker’s beloved hit. Spensha had been in the hot seat tonight, already having performed a hit from Kacey Musgraves and now duetting alongside everyone’s favorite country coach. Watch the full video performance from tonight’s episode and let us know if you think they did a good job! We’re sure Tanya loved this!